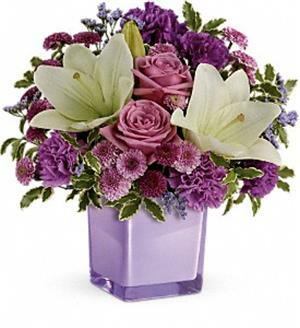 A medley of Lavender flowers and white lilies are designed in a colorful lavender cube vase. Perfect for any occasion and the right size to add charm anywhere it's placed. Lavender roses, white asiatic lilies, purple carnations, lavender carnations, purple button spray chrysanthemums and lavender button spray chrysanthemums are arranged with lavender limonium and pitta negra. Delivered in a glass cube. Approximately 13 1/2 W x 13 3/4 H Flowers used subject to availability and season. Some substitutes may be necessary.